The Supine Pelvic Tilt Exercise demonstrates the posterior pelvic tilt, which helps to strengthen the muscles in your lower abdominal spine and stabilise your lower back. It will help you learn how to position your pelvis properly, which is important for good posture and in preventing back pain. This is an easier version of the Posterior Pelvic Tilt exercise. The Supine Pelvic Tilt Exercise forms part of the Golf Mobility series of innovative and dynamic exercises that will help to improve your joint and muscle mobility, improving your range of motion while increasing functional strength within the entire range of that motion – thus helping to prevent injuries and building the foundation for a consistent, accurate, and powerful golf swing. Figure 1. Supine Pelvic Tilt Exercise Video. Start by lying on your back on a matted surface, your feet flat on the floor with your hips and knees bent to approximately 45 degrees. Fold your arms in front of your chest, and relax your back. Exhale as you pull your belly button back toward your spine, lifting your buttocks and pressing your lower back firmly against the floor. Inhale as you return to the start position. For more of a challenge, see the Posterior Pelvic Tilt Exercise. To build a great golf swing, you must learn how to move your pelvis into extension, flexion, and neutral postures. Learning how to position your pelvis properly will enable you to keep your spine in a safer posture throughout the golf swing, and allow for better weight transfer to your lead leg (the left leg in a right-handed golfer) in the downswing. 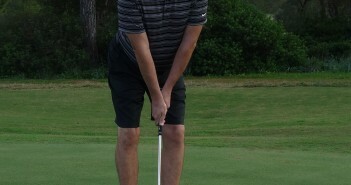 Many golfers have a tendency to get stuck in an anterior tilt of the pelvis, causing too much curve in the lower back (known as hyperlordosis). This position places greater stress on the joints in the lower back, is often associated with lower back tightness or pain. For more information on the perfect golf posture, see Golf Swing 101 – Setup: Basic Posture and Golf Swing 103 – Setup: The Perfect Golf Spine Angle. This exercise mainly involves your erector spinae, psoas major, rectus abdominis, and gluteus maximus. 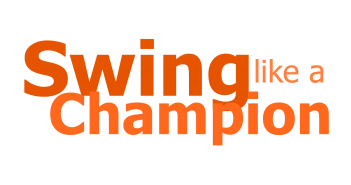 Golf Swing 101 – Setup: Basic Posture. Golf Swing 103 – Setup: The Perfect Golf Spine Angle.